Urbanite. A new book by DIGBMX photographer Ricky Adam. Watch the movie. I think there might be only fifty different people in the world that get repeated (It makes a pattern). I've seen your face in all the half where in between places to no-name cities; I find the whole thing overwhelming. Thoughts while riding on a road I didn't make; I can put anything in my mouth and run it through in a day / I want to be as effective as the animals I've seen along the way / I'm breathing in the air that's been through everyone that's ever lived. - Jason Farrell / Bluetip lyrics. Graffiti art from the Berenkuil in Eindhoven, Holland. We pass this spot a regular basis and it's got new graffiti every time. We went over this time with a camera in hand to show you some of the pieces that are currently up. Different styles from several artists. 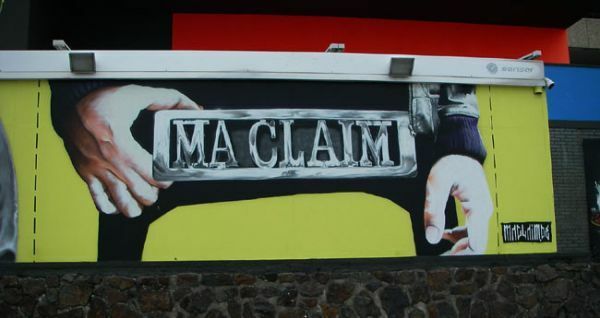 We spotted work from zhe Germans, the French, the Dutch and who knows what other parts of the world. Enjoy. Alistair Whitton sent in this photo. He didn't even have to put his bike in the sun and bring out the chalk to make a silhouette of his bike. 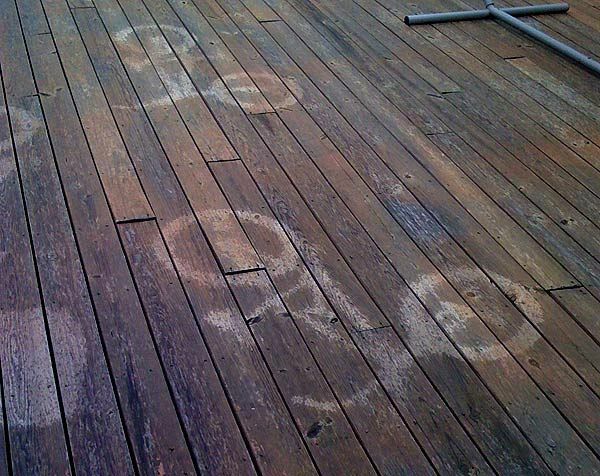 You see, at Woodward it does rain too and after a quick downpour these dry spots appeared when the bikes were removed. Having a camera handy at that point doesn't happen a lot but Alistair got the job done and makes it to the "Comic 'n Art" page here on FATBMX. Got something? Send it in. 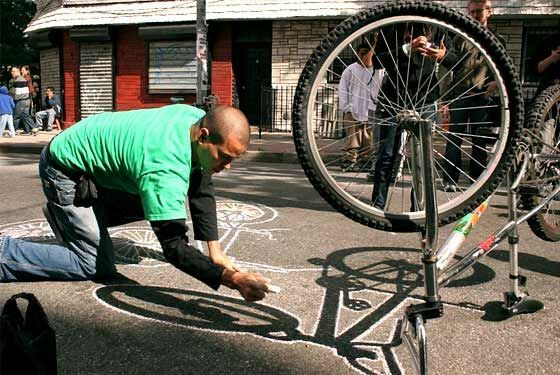 Deamer sent us this photo of a man using a BMX bike to create some street art. Yup it's original and maybe an idea to do the same next time the sun comes out. 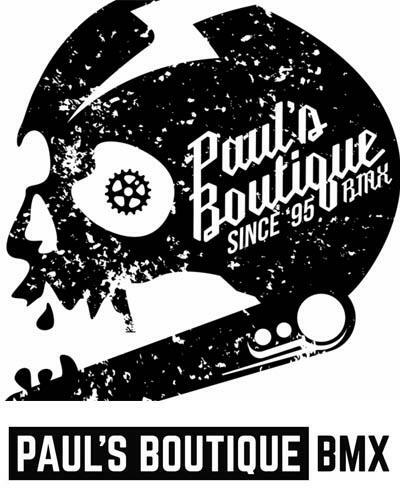 Do you have some BMX related art on your computer that you want to share with the FATBMX readers? Send it over and we'll post it in the Comic and Art section. Send a copy of your drawings, paintings, sculptures, comics or whatever art you do to the contact address listed in the left column. We're looking forward to hear from you. The other day we were driving on the Boulevard in Vlissingen and noticed a tall building full of graffiti art. We had to stop to check it out and it was actually great stuff. The camera came out for a few shots and here we are, a perfect fit for the FATBMX Comic and Art section. The Kijkdoos outdoor graffiti exposition was sponsored by one of the largest banks in the Netherlands. Good to see the street artists are receiving some respect and support. We get around a lot but most of the time we see the airport, the hotel and the contest venue. When we had some extra time to kill in Berlin we decided to take a tram to the city to scope things out. Luckily Bruno and Martin Hoffmann were with us. Bruno was born in Berlin and we basically went to the place where was born (Kreuzberg) as a pilgrimage. Haha, not really but at least Martin had some good stories to tell about the area. Along the way we took some pics which usually end up somewhere on the computer but why not show you what we ran into in the great city that's called Berlin. 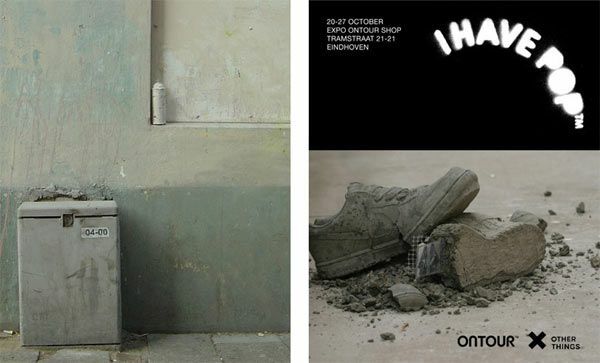 "Other Things" is an exposition that is part of the Dutch Design week that is being held in Eindhoven, NL from 20 - 28 October 2007. 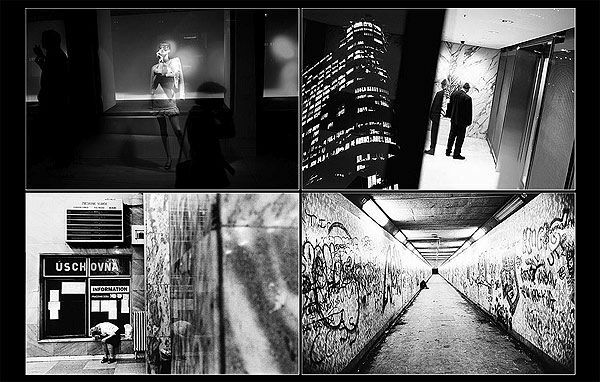 Juse will show some of his work in the new Ontour shop/expo area. The official opening is on Saturday 20 October from 12 - 6pm. Curious? Here are a couple of related websites that you can check out before making it over to Eindhoven. Digital BMX art on FATBMX.com. By Ryan James. 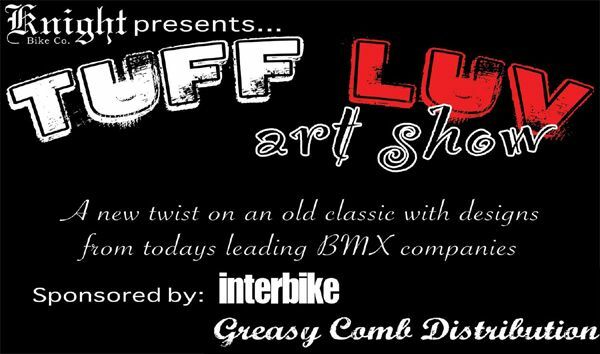 Knight Bike Co's Tuff Luv Art Show is on the road again, this time to Vegas. 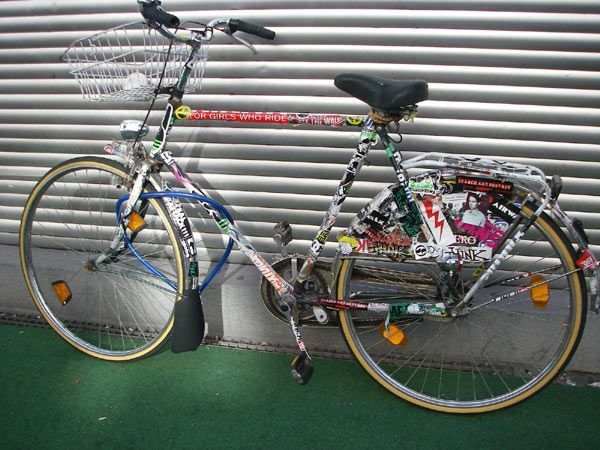 Greasy Comb & Interbike are sponsoring the booth & transportation to bring Tuff Luv to the bike geek masses. Check it out across from the Sunday & 2 Hip booths in the BMX Zone. 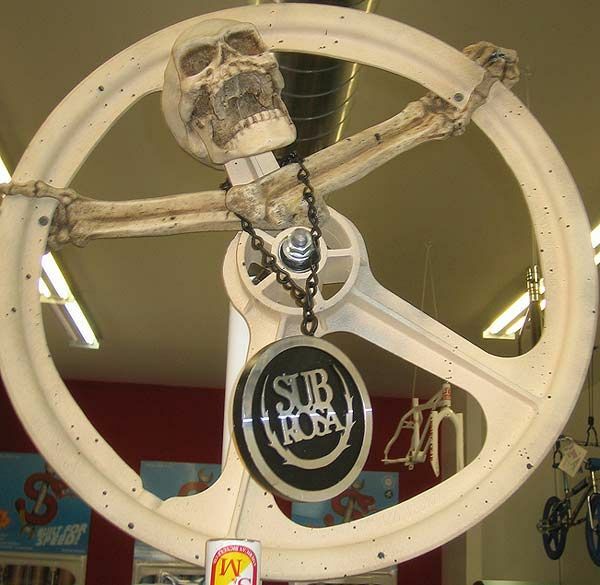 Past weekend there was a artshow at SLB in Los Angeles (Pro skater Sal Barbier's shop) and it was fairly interesting to see what the possibilities are decorating a Skyway Tuff Wheel II. I personally like the wheel the way it is, but nevertheless that didn't stop anyone from doing their "art" version on the legendary Tuff Wheel. Realize it is about 100 F (37 C)in the shade, while this was the last holiday weekend in the US (Labor day). The vibes were good, sun was out and the DJ was cranking it up a notch. Oh and you can't go wrong with free beer either... All and all I thought it was a cool concept, but I wish the presentation was done slightly different, since standing around a "Tuff Wheel Xmas tree" with a bunch of people, almost felt like you were spooning each other at one point.